With over 15 years of proven field use. The FieldPak storage device is used to store video, audio, and metadata. FieldPaks use disk drive technology for short and long format recording and solid-state technology for extreme conditions. FieldPaks are accessed through FieldPak Adapters connected to a PC or Mac computer. PakTools PC software helps organize your workflow before you get into the field. To help manage a multi-event video shoot, you can configure and name the FieldPak, and create and manage multiple bins. Use PakTools to define custom metadata files for constrained data entry during acquisition. Metadata management lets you begin your project with the end in mind, locating video clips faster. Use your computer's USB interface to connect to the SAT Sled. Insert your FieldPak into the Sled to access the media stored on the FieldPak. The SAT USB Sled is compatible with all FieldPaks, including the new Solid State FieldPaks. The SAT 210 accommodates two FieldPaks at once, so you can view media from both FieldPaks instantly, it is compatible with all FieldPaks, including the new Solid State FieldPaks. The SAT 310 (not shown) supports 3 Fieldpaks. The SAT 110 is lightweight, portable and used for field or office use with any FieldPak, including the new Solid State FieldPaks. 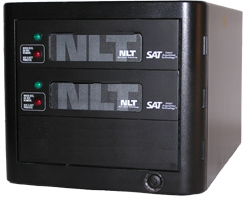 The SAT 110 can be connected to the host as a USB 2.0, 1394a or eSATA connected device.